Saturday morning, I woke up, made a batch of Pumpkin Spice coffee, and watched the first hour of Dead Silence—a horror movie about ventriloquist dummies coming back to life and killing people. Ew. I got dressed and was soon ready for the Dia de Los Muertos celebration at the Mesa Arts Center. For the ride, I burned a special Halloween CD, featuring such numbers as “The Monster Mash,” “The Time Warp,” and my favorite: “I Put a Spell on You” by Screamin’ Jay Hawkins. Let’s not forget the décor. Skulls, skulls, everywhere! 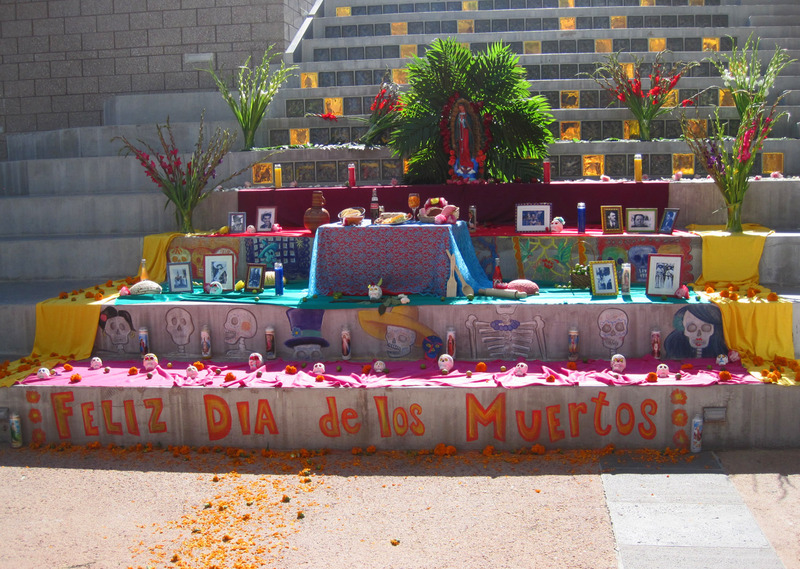 And altars with huge flower arrangement, candles, and Dia de los Muertos masks! Despite the beautiful, sunny day, the décor made it feel at least a little creepy, and of course, I bought a skull for our house AND did a rubbing that looks like a southern belle, dead and skeletal with an evil grin. Oh, and how could I forget the mouth-watering authentic chicken mole tacos? Part of the Dia de los Muertos tradition is eating the favorite dish of your deceased relative. So on my way home, I picked up some beef ravioli and vodka sauce in memory of Uncle Barney. While prepping dinner for Jake (who had to work Saturday—twelve long hours), I watched Rocky Horror Picture show … again. I only watched it four times this month. I danced around the house to “Sweet Transvestite” as I prepared for my costume: a Stepford Wife. Costume fully intact, I left the house and spent the rest of the evening at first, a house party, and then, our local Litchfield Park haunt, Taps Signature Cuisine and Bar. There was much drinking, dancing, and rejoicing, as the Stepford Wife and (generally speaking) a bunch of strangers wallowed in the beauty of the night, while ducking fake cobwebs and waving our hands over boiling dry-ice cauldrons. Now, Halloween Town must come to an end. The decorations must be removed and costumes stored in closets for another year. 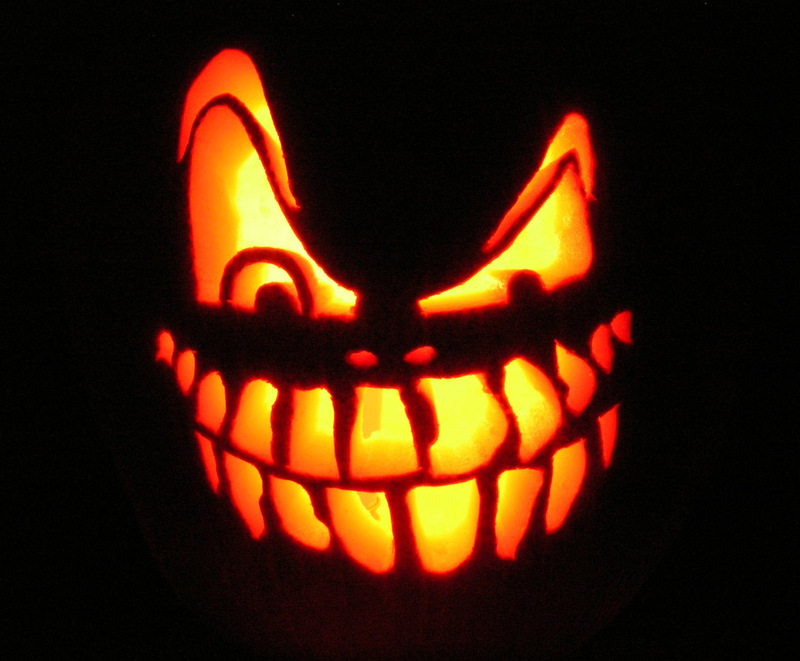 Rotten pumpkins must be thrown away, and leftover candy from trick-or-treaters must be consumed in plenty. This month has been filled with freaky fun. I’ve watched approximately 20–30 horror movies, dozens of ghost hunter programs on the Travel Channel, and even the little pumpkin lights that danced around the skeleton hanging on our front door. I’ve learned about new holidays: the Wiccan Samhain and the Mexican Dia de los Muertos. I did just about everything I set out to do in the month of October, and I enjoyed it all. Looking back, I’ve come to realize something: Halloween time doesn’t have to be only in October. Halloween time isn’t only about October 31. It is about creepy, eerie stuff—things that go bump in the night, things that scare you, things that make your heart race, things I love! At the end of the movie Scrooged, Bill Murray goes on a whole rant about Christmas and how we’re all more cheerful at Christmastime. We laugh a little easier. We smile a little more. We’re filled with Christmas cheer. I say, we should carry a bit of Halloween spook with us all year long. Randomly watch a scary movie in the dark. On a hike in February, jump out and scare your friends for no reason other than to see ‘em scream. Eat a mini-Twix bar in the middle of June and raise that candy to Stingy Jack. And as my pumpkin-carving pro Mary would tell you, wear a costume any night of the week, just because you can. Maybe it’s just me, but I say, creep on, friends. Creep on. All year round. Thanks for sharing Halloween Town with me this month. And if you ever need a really good scare, just send me an email. I’ll tell you about how the Detroit Lions beat the Washington Redskins … two years in a row. BOOOOOOOOOOOOO! It sounds like you had a pretty great weekend. If you liked the Dia de los Muertos stuff going on in town, you’d probably really dig the All Souls Procession in Tucson (http://tucsonallsoulsprocession.com/ – website’s not great, but good pics and video). I still have yet to do it, but all my friends that have say it’s totally worth driving down to Tucson for. In regards to not liking mariachi music, I think you’re actually thinking of Norteno music which has some polka influences. You are full of useful info!!! Thanks for all this. Learn somethin’ new every day. And I’d love to be in Tucson for the processions someday!